Now, for you, that don’t know what you will listen to here I will ask you not to judge this release by its back cover. I know that the band members have this Norwegian black metal look, but have in mind that this kind of look was first introduced by hard rock/heavy metal artists like ALICE COOPER and KING DIAMOND and definitely these 2 guys have influenced FALLEN ANGEL both musically and in the way they evolve their concept fantasy/horror story. Musically FALLEN ANGEL play the kind of sound that here in Greece is very successful, just check out the success that ICED EARTH have here. So, the band plays, in simple words, U.S. heavy/power metal with some thrash and speed elements. However, in their new releases there are also plenty of mid tempo compositions that sometimes also flirt with the doom metal sound (as it is played by bands like CANDLEMASS and SOLITUDE AETURNUS). Just check out songs like “Lord of the Flesh”, “Dance of the Dead” and “Blackened Hearts”. If I have to compare them with some known bands in order to give you a hint of what you will listen to here, then I would definitely say that fans of groups like ICED EARTH, HELSTAR, METAL CHURCH and VICIOUS RUMORS should check them out. Besides the skillful playing of the band members I have to mention the voice of Caleb - The Teller of Tales, which reminded me of musicians like UDO, WAYNE and James Rivera. Once again FALLEN ANGEL have done a very good work and offer us an album that moves on the classic U.S. heavy/power metal paths without ever becoming retro or a copycat. The guys filter their influences and they transform them into their own recognizable sound. The only negative thing, if I can name it as negative, is that there are some repetitions of riffs and melodies, but this is something that no one can avoid when they create an album with duration over 70 minutes. Actually, this is a big advantage for the band that although they create an album of such duration they manage to keep the interest of the listener on the same level from the first till the last second. I won’t write much more. 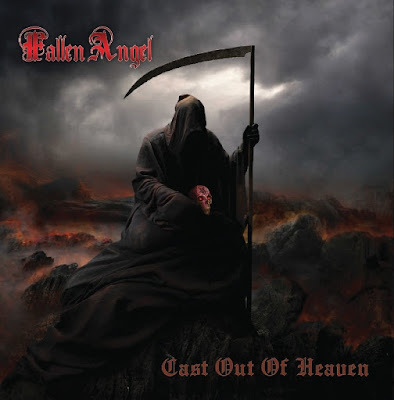 If you are into the U.S. heavy/power metal sound and like bands like those that I have mentioned above, then FALLEN ANGEL and “Cast out of Heaven” will surely make your day. Check them out. Αναρτήθηκε από Nick Parastatidis στις 1:42 μ.μ.